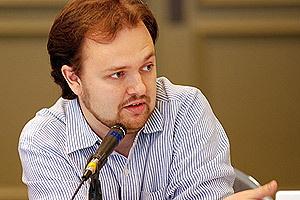 Marc Ambinder reports that the New York Times has hired his Atlantic colleague Ross Douthat as an op-ed columnist. This is basically to take Bill Kristol’s place as their #2 conservative columnist (alongside David Brooks) and it seems like a pretty good choice to me for a couple of reasons. First, Ross has a fluid, intelligent writing style that’s well suited to the 800-word op-ed format. Second, he fits the post-Bush zeitgeist: he is, at core, a conservative Barack Obama. What I mean is this: like Obama, he’s always careful to acknowledge the arguments of his adversaries and to take them seriously. Like Obama, he does this overtly and deliberately. And like Obama, this is mostly for rhetorical effect: both of them use this technique to mask the fact that they rarely change their minds. They might listen respectfully, but after they’re done they go on doing whatever they intended to do in the first place. This isn’t a criticism (I don’t change my mind very often either, after all). In fact, it makes him a more than normally worthy dissenter to the Age of Obama. His column should make for interesting reading.